NEW YORK (Reuters) - The manslaughter trial of a New York City police officer who fired the bullet that killed an unarmed black man in the darkened stairwell of a housing project is due to begin on Thursday. 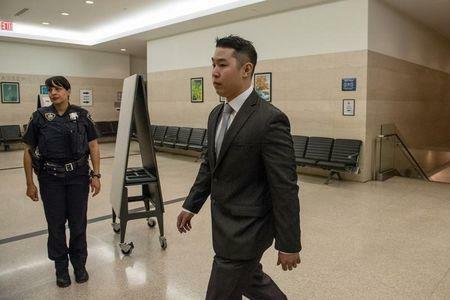 Officer Peter Liang is also charged with reckless endangerment, official misconduct and other counts for his actions inside a Brooklyn public housing complex on the night of Nov. 20, 2014. The death of the victim, 28-year-old Akai Gurley, added to the outrage that fueled national protests over police use of force against minorities in cities including Ferguson, Missouri; Baltimore and Cleveland. Liang's lawyers have said the shooting was accidental. The shooting occurred days before a grand jury declined to indict a white police officer for killing teenager Michael Brown in Ferguson and weeks before a separate grand jury brought no charges against a white New York officer for the chokehold death of Eric Garner. Both Brown and Garner were unarmed black men, and the decisions not to charge the officers gave momentum to the "Black Lives Matter" movement. Liang is not accused of intentionally shooting Gurley, who was walking in the unlit stairwell with his girlfriend. The bullet ricocheted off the wall and struck Gurley in the chest. Prosecutors have said Liang acted recklessly by drawing his weapon in the first place. They have also said he and his partner argued for minutes about whether to report the shot for fear of discipline, though prosecutors have not released evidence suggesting the two officers immediately realized someone had been wounded. Liang, who is Chinese-American, has hired two former NYPD officers as his defense lawyers: Rae Koshetz, a former deputy commissioner who oversaw internal disciplinary trials for NYPD members for 14 years, and Robert Brown, a former captain. Brown said Liang had committed no crime. "It was just a terrible tragedy," he said. Liang has opted for a jury trial, rather than a judge-only trial, and Brown said it remains possible that Liang will testify in his defense. "People like to hear from the person who's charged," he said. The case is likely to turn on whether the jurors believe Liang acted reasonably in unholstering his weapon in the darkened stairwell, where broken lights had gone unrepaired for days, or whether he ignored the risk that doing so could endanger others unnecessarily. Liang's partner, Shaun Landau, is expected to testify for the prosecution under an immunity agreement.